Directorate of Accounts and Treasuries, Assam. 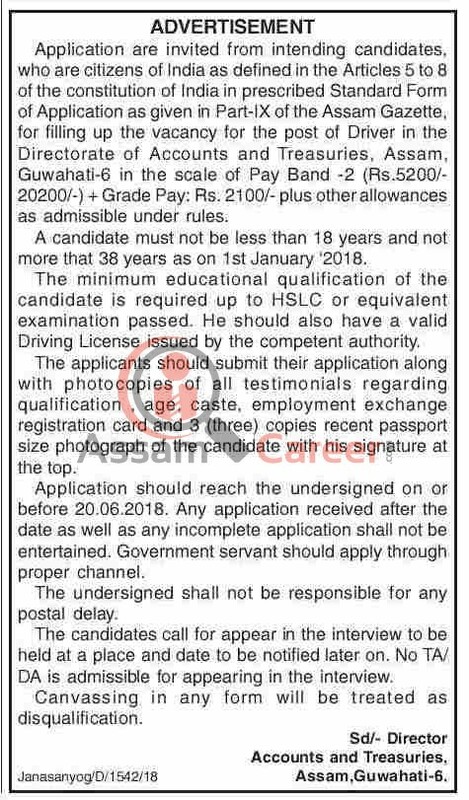 Application are invited from intending candidates, who are citizens of India as defined in the Articles 5 to 8 of the constitution of India in prescribed Standard Form of Application as given in Part-IX of the Assam Gazette, for filling up the vacancy for the post of Driver in the Directorate of Accounts and Treasuries, Assam, Guwahati-6 in the scale of Pay Band -2 (Rs.5200/- 20200/-) + Grade Pay: Rs. 2100/- plus other allowances as admissible under rules. Age: A candidate must not be less than 18 years and not more that 38 years as on 1st January ‘2018. How to apply: The applicants should submit their application along with photocopies of all testimonials regarding qualification , age, caste, employment exchange registration card and 3 (three) copies recent passport size photograph of the candidate with his signature at the top. Application should reach the undersigned on or before 20.06.2018. Any application received after the date as well as any incomplete application shall not be entertained.